Internet users conduct billions of web searches every month. In fact, comScore reported that Americans alone queried Google, Yahoo!, Bing, and other search engines some 18.6 billion times in October 2010. What’s more, the number of searches is growing. comScore reports that Americans conducted some 800 million more searches in October than they had in September. But not every single search returns the results the user is looking for. Rather, it is very common for folks to search for a term and get too much information. Those users refine their search, fiddle with the query phrase, and sometimes even try adding quotes in order to limit the results to a relevant set of data. 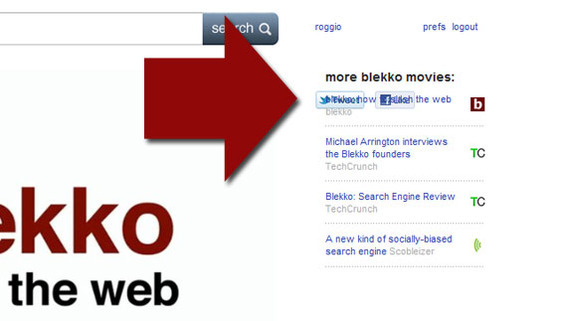 Blekko is a new search engine designed around filtering web results. “The PEC Review” is my weekly column aimed at introducing you to the products or services that I believe will help you improve your ecommerce business. This week, take a look at Blekko. Blekko’s slash tags are a way to filter your results and “slash” through search clutter. For example, if I search for “ecommerce,” Blekko—like many search engines—returns more than five million results. If I have really been looking for the technical side of ecommerce, I could add the slash tag “/tech,” and Blekko will only return results relevant for “ecommerce” from technology sites. Adding both “/tech” and “/date” would return just technology-focused results with the most recent posts at the top. Blekko’s slash tags filter results. Adding the slash tag “/seoblog,” as a further example, would have limited my search results to just blogs or sections of blogs focused on search engine optimization. Blekko comes with many built-in slash tags for things like “/date” or “/tech-reviews” and allows users to create their own custom slash tags. To create your own slash tags, you’ll need to register with Blekko. But once you have done that you can add a slash tag that features results from the sites that you believe do the best job of providing content around a particular topic. 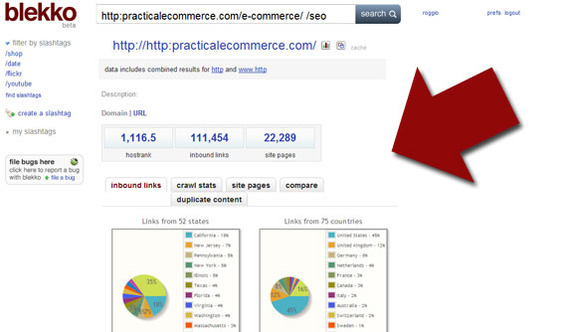 Employing your new slash tag will limit your results to just those sites. Another Blekko filtering feature is the “spam” link. Blekko apparently hates web spam (as do I). When you come across a search result that is nothing but junk, just click the “spam” link and you will never see a search result from that site again. It is like you added the site to your own personal blacklist. Blekko lets you black list sites you don’t like. In many search engines, determining why one page ranks more highly than another is an exercise akin to alchemy. But Blekko puts SEO data out in the open. Click the “SEO” tag on any search result to see the data behind Blekko’s decision to place the page where it did. Blekko reveals the underlying SEO data for every search result. You can also add the “/rank” tag to any search in Blekko to get a list of the search engine’s page rank scores for a particular search term. Finally, because Blekko has users register to save slash tags, the search engine keeps user profiles and has a community of sorts wherein you can follow other users slash tags and discover new sites. I would like to see a little more polish in Blekko’s interface; for example, some of the icons in the Blekko side bar are misplaced. Blekko could use a bit more polish in places.